You can filter the list below by clicking on a letter, or by entering a word into the Search by Title box. Note: After a letter search, you must select "All" to reset the list (filter) before using the Title Search. Eight out of ten Americans will seek medical attention for a back problem sometime in their lives. That's an alarming statistic. Help your employee's avoid back injuries to maximize efficiency and put an end to these injuries. Give them reliable techniques for back safety. The machines and equipment found in most industrial settings can involve hazards and sometimes that means exposure to blood. Help protect your employees from the dangers of bloodborne pathogens with the information in this program. Bloodborne pathogens can kill but with the help of this program, your workers will get the tips and training needed to guard themselves from such deadly organisms. This informative program covering the basics of bloodborne pathogens precautions is ideal for workers who are on the scene at accidents. Blueprint Reading for Welders: Basic Blueprint Reading - Lines, Views & Dimensions is part one of the Blueprint Reading for Welders three-part training series. In order for the welder to use blueprints effectively, he or she must be able to interpret them correctly. This involves properly reading the conventions used on the prints and understanding how the prints represent the finished assembly. This course introduces students to the basic lines, views, and dimensions that are used in blueprints. Blueprint Reading for Welders: General Welding Symbols, Part I is part two of the Blueprint Reading for Welders three-part training series. When specific requirements exist for welds, symbols are used to identify the specifications. This course introduces students to the general welding symbols used on blueprints. Describe a weld shape and finish from a blueprint. Blueprint Reading for Welders: General Welding Symbols, Part II is part three of the Blueprint Reading for Welders three-part training series. This course will extend students' knowledge about welding symbols and specifications that appear on blueprints. Match a blueprint with welding symbols to the work piece it represents. 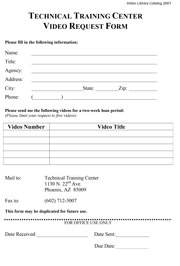 Complete and submit a Video Request form to borrow videos for a two-week loan period.